We are so excited about this upcoming year! There are so many wonderful and new things to share with you. Please join us on the evening of October 2nd, 2013 from 4:00 until 6:30 for our official opening for the 2013 – 2014 school year at the Book Bank! There will be a brief ceremonial presentation in the beginning to orient you to all of our new staff and updates on logistics and daily operation. Here are some details for you to know in preparation for your attendance on October 2nd, 2013. First, we are in the SAME building, but a NEW room. Our new room (T137) is easily accessible from the loading dock on the Haines Street side of the Martin Luther King Jr. High School. Utilize the Haines Street parking lot and follow the signs and directions when visiting us this year at the Book Bank. We are only steps away from the loading dock, so transporting books and supplies from the Book Bank to your car will be much easier! Good news, right? We bet it is! In addition, when visiting the Book Bank, you will need to wear your School District or Employee ID badge, as well as carry your Philadelphia READS Book Bank Loyalty ID card for safety reasons. These cards will be distributed at the opening event, which is another reason for you to make an effort to be there! Lastly, we have many other new and surprising elements to add to our Book Bank, so you don’t want to miss out on our opening night! To date, the best mode of communication is still “word of mouth,” so please “Save the Date” and “Spread the Word!” On October 2nd, 2013, you will WANT to be there! The Book Bank provides children’s books for classroom libraries and school supplies for students — free of charge — to Philadelphia educators who teach in under resourced public, charter, and parochial schools, day care centers, after school programs and other educational sites. All books and supplies are donated through corporate and volunteer-hosted PHILADELPHIA READS book drives, corporate, and individual donations. Teachers are invited to select up to 350 books per year – 100 per Book Bank visit. 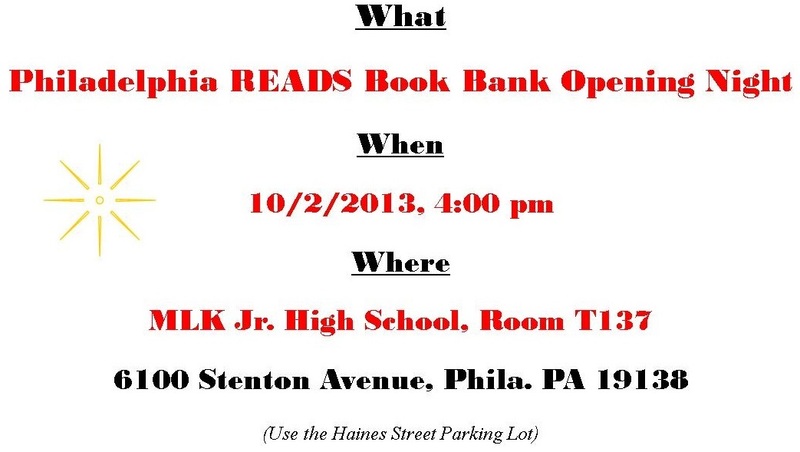 Copyright © 2013 by PHILADELPHIA READS All rights reserved.